Your commercial property may feel dry and hot today, but in a few months you will find out why waterproofing in Miami is such an important job for any commercial roofer. Every blazing hot surface in May, basking in near-tropical sunshine, can become a water soaked sponge during Miami’s wet season. Soggy southern Florida has a four-month rainy season from June through September, according to City Data. During that time, Miami gets an average of 34.93 inches of rain, says U.S. Climate Data, which is more than half of its yearly average of 61.93 inches. All that rain ends up hammering your roof, soaking into foundation walls, and saturating surfaces like parking garages, plaza decks, and pedestrian walkways. Most waterproofing in Miami is done in dry weather, so the chemicals can have time to cure properly. 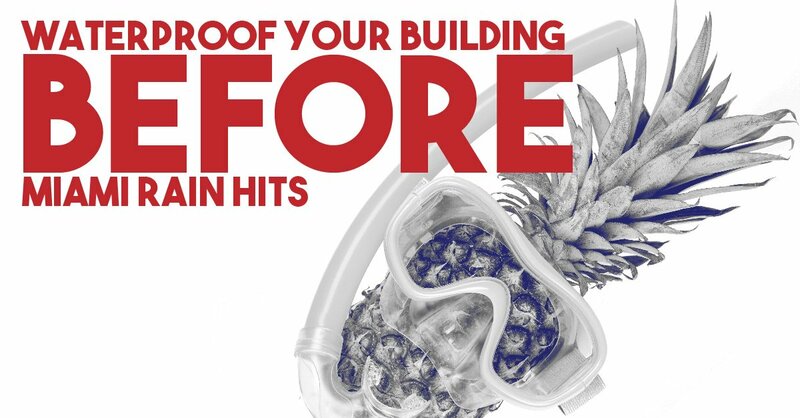 The longer you have between application and the first hard rains of Miami’s wet season, the better for your building. While some limited waterproofing can be achieved in humid weather, the nature of the process and the types of chemicals means any precipitation is likely to dilute or wash away efforts at waterproofing in Miami commercial properties. Whether your Miami property needs extra years of useful life from an aging roof, or you need to ensure a waterproof building envelope with below-grade sealing, you can depend upon the expertise of A-1 Property Services to help with waterproofing in Miami. Contact us today to learn how we can help you prepare for Miami’s worst weather now, and for many years to come.